Last month the better half and I decided we needed a little rest so we headed up north to Whitby in North Yorkshire. While we were there we took note of some of the older fishermen in the bay. I have always admired the traditional working-man’s practical style and often look for inspiration for my own wardrobe (Lumberjack, Cowboy and Oil Prospector are already in there). I was especially drawn to the wool jumpers a lot of the gents were wearing so I endeavoured to find out where I could purchase an authentic fisherman’s jumper. 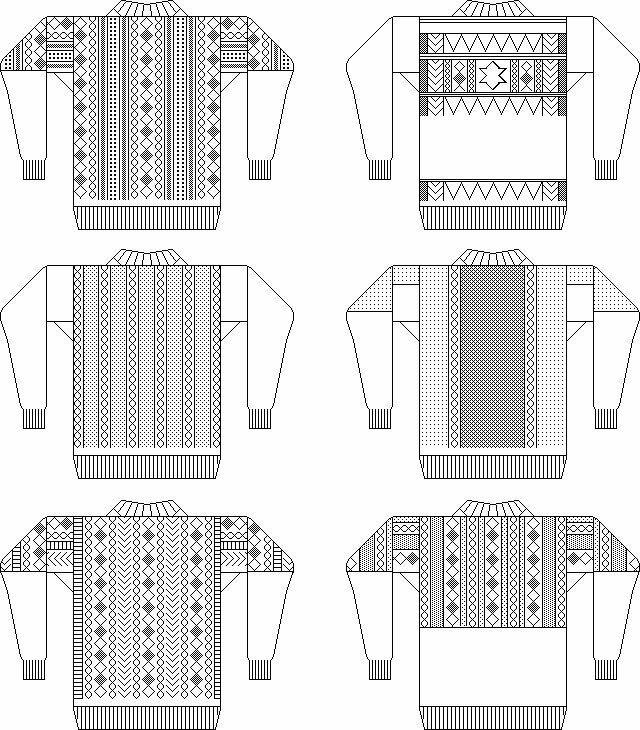 I found an old knitting shop and decided to look in and ask about the jumpers and I was politely informed by a delightful old woman that I wasn’t looking for a ‘Jumper’ but a ‘Gansey’. 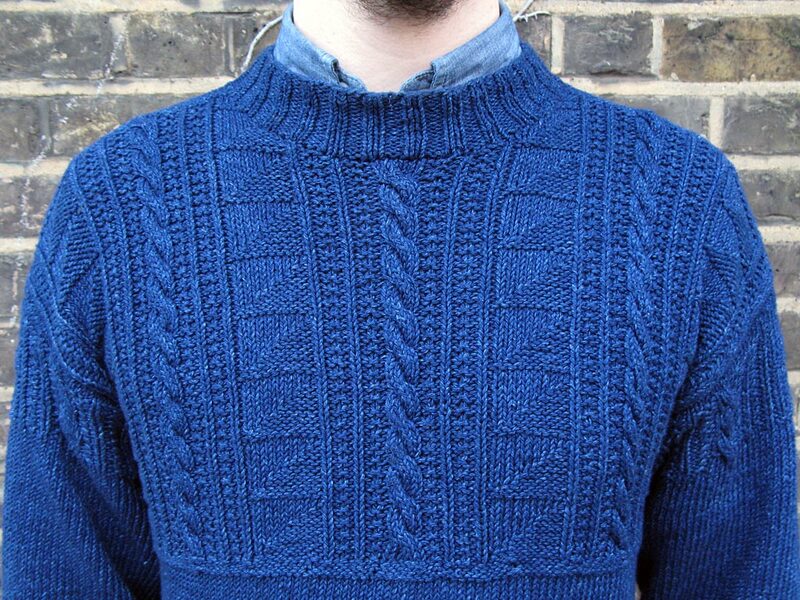 The term ‘Gansey’ is derived from Guernsey, the Channel Island in which this particular style of knit originated. So what makes a Gansey? 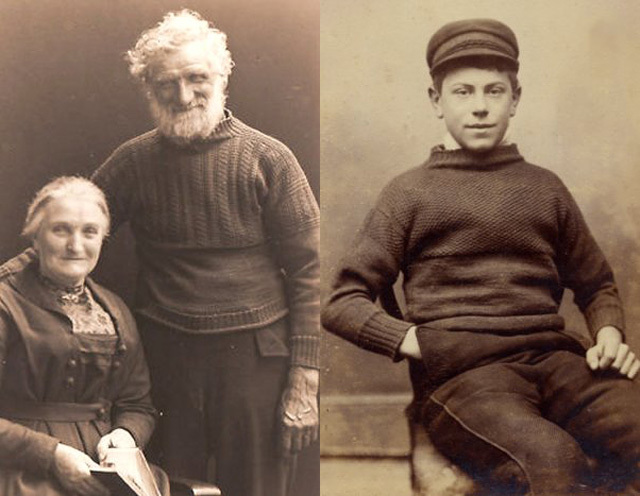 The Gansey is a unique type of jumper traditionally worn by fishermen. They are knitted with 5 ply worsted wool in one piece with no seams. Five small double ended needles or wires are used to knit in the round creating a really tight knit (or close knit) which creates a wind and somewhat waterproof protection against the elements. 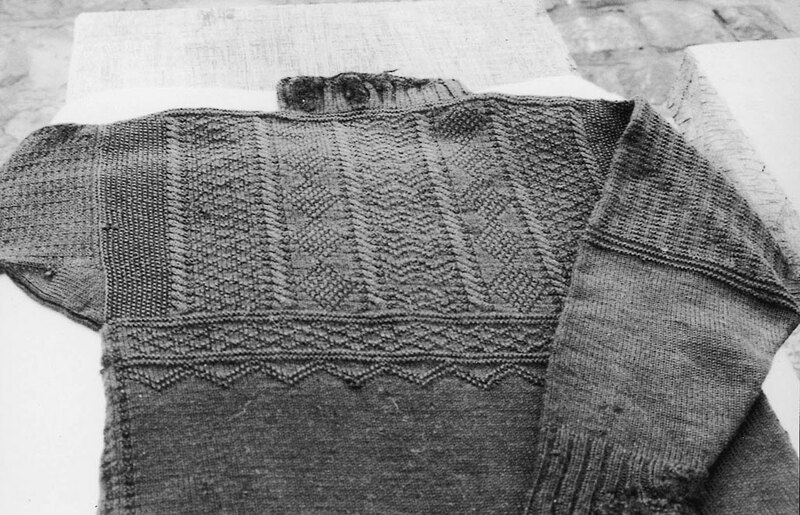 The intricate patterns often concentrate towards the upper part of the garment around the shoulders, arms and chest and are often made reversible so they can be worn either way around prolonging the wear of the Gansey before it needs repair. As the bottom half of the Gansey suffered most wear and tear it was often left plain so the lower body, cuffs, and the plain of the sleeves could easily be pulled out and re-knitted. The sleeves were often rather short so that the cuffs didn’t get caught or stay permanently wet when the men were fishing. The traditional fisherman would wear a Gansey next to the skin with the addition of a pure silk scarf to stop chaffing around the neck. This would also create a seal to keep in heat. The Gansey would also come in to play when a Fisherman was out of work. To denote this he would turn up the bottom of his Gansey to let other Captains know he was approachable for hire. The turned up section also doubled as a handy pocket later adopted to keep their tobacco and matches. There are many Gansey patterns, often depicting fishing related iconography such as anchors, cables, and diamonds (nets) and some included weather and land influences, from lightning strikes and hail to furrows and the harvest. 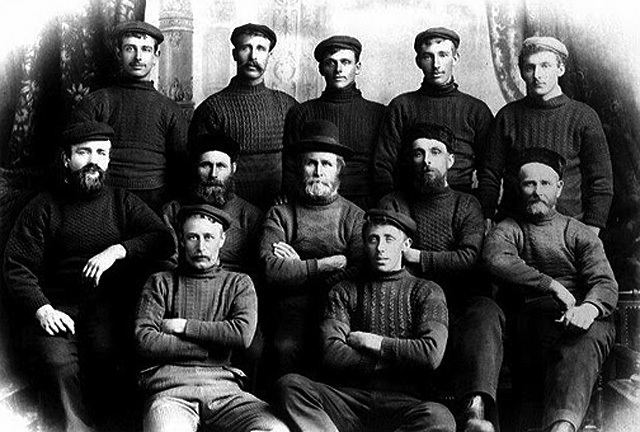 Many fishing and port towns around the North East coast had their own unique styles (which often came in handy when identifying drowned seamen). The most popular styles still available include Staithes, Runswick Bay, Whitby, Robin Hoods Bay, Scarborough, Filey, Flamborough, Patrington, and Humber Keel. I decided to go for the Whitby Gansey as I loved the ‘half and half’ design, which covers the chest and upper arms with patterning and leaves the lower half plain. I also plumped for a denim knit which is untraditional, but lighter and should see me in to the late spring/early summer without being too warm. The denim wool is naturally died with indigo and like a good pair of jeans will naturally wear lighter over time. 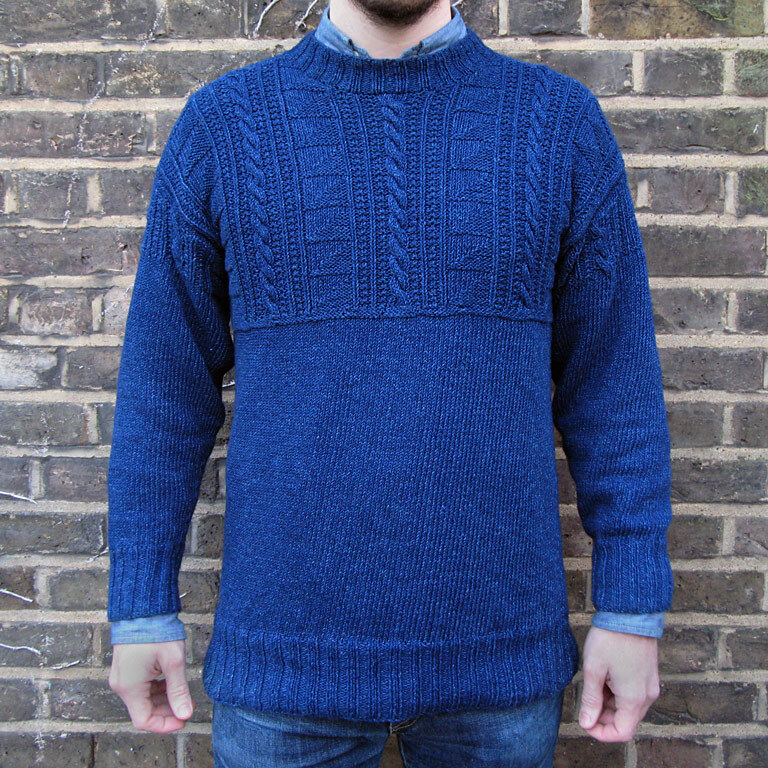 Each Gansey is made to measure and takes 6 to 8 weeks to hand knit and you can pick and choose your own specifications. I went for a fully traditional crew neck and plain ribbed cuffs and hem. If possible, I would recommend going to get measured up and talk in person about your requirements, but if you can’t then the place I bought mine from (details below) do an excellent mail order service. I can’t think of a garment that’s going to look better with this beard I’m growing. Next step: take up full time pipe smoking. This entry was posted in Clothing, Denim, Textiles and tagged Gansey. Bookmark the permalink.